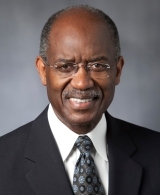 Home > About the Program > National Advisory Committee > Sherman James, Ph.D.
Sherman A. James was appointed a Research Professor of Epidemiology and African American Studies at Emory University on July 1, 2014. Prior to his retirement from Duke University on June 30, 2014, he was the inaugural Susan B. King Professor of Public Policy in Duke’s Sanford School of Public Policy from 2003-2014. At Duke, he also held professorships in Sociology, Community and Family Medicine, and African and African American Studies. Prior to joining Duke’s faculty, he taught in the epidemiology departments at the University of North Carolina-Chapel Hill (1973-89) and at the University of Michigan (1989-03). At Michigan, he was the John P. Kirscht Collegiate Professor of Public Health, the Founding Director of the Center for Research on Ethnicity, Culture and Health (CRECH), Chair of the Department of Health Behavior and Health Education, and a Senior Research Scientist in the Survey Research Center at the Institute for Social Research. He received his AB degree (Psychology and Philosophy) from Talladega College (AL) in 1964, and his PhD degree (Social Psychology) from Washington University in St. Louis, in 1973. He is the originator of the John Henryism Hypothesis which posits that repetitive high-effort coping with social and economic adversity is a major contributor to the well-known excess risk among poor and working class African Americans for hypertension and related cardiovascular diseases. Using large data sets, James conducts quantitative research on the social determinants of US racial and ethnic health disparities. With a grant from the Robert Wood Johnson Foundation, he is completing a book length manuscript on the likely social and psychological mechanisms through which 1960s civil rights era legislation (i.e., The Great Society legislation) dramatically, but only briefly, narrowed US Black/White racial health disparities. A social epidemiologist, James was elected to the Institute of Medicine of the National Academy of Sciences in 2000. In 2001, he received the Abraham Lilienfeld Award from the Epidemiology section of the American Public Health Association for career excellence in the teaching of epidemiology. He is a fellow of the American Epidemiological Society, the American College of Epidemiology, the American Heart Association, and the Academy of Behavioral Medicine Research. In 2007-08, he served as president of the Society for Epidemiologic Research (SER). In 2008, he was named a Distinguished Alumnus of Washington University in St. Louis.